Usually the best cure for a virus is bed rest, TLC and chicken soup. But when a computer gets sick a more radical remedy is required. Tina Hackett introduces D.A.V.E, the robotic hero of Graftfold's latest. First impressions of shoot-'em-up Virocop would suggest a fairly young audience. However, further investigation of the game reveals more to it than first appears. It's a mixture of shooter/platformer - a genre that has somehow been neglected on the Amiga of late - and has been created with such fine attention to detail that it looks set to shine.. Behind the game are the talented Graftgold team, renowned for such hits as Uridium, Fire and Ice, and Rainbow Islands. As you can imagine, the majority of the game involves negotiating platforms and blasting the enemies and viruses into oblivion. There are a range of 20 different weapons at your disposal, from twin missile launchers to flame throwers. The shots you'll need to kill an enemy depend on the size and strength of it. Some may be killed with one straight bullet, others with a mortar bomb, for example. To finish a level you must exterminate a certain amount of viruses, so the game can be played in either of two ways. One is to rush through all the levels, avoiding enemy fire and stopping to kill just the viruses, or you can go at a more slower pace and kill baddies as you see them. However, the more points you earn, the more chance you have of earning an extra life. Bonus lives can be discovered on the levels and are also awarded at 10,000 40,000 points and so on..
D.A.V.E. runs on a battery which is drained as he is damaged. Pick-ups can be collected to replenish it and you'll need to be able to judge when you need them as you can't collect energy you can't use. There's also some kind of puzzle angle to the game as you have to figure out how to move certain platforms and which switches do what. There isn't really a game like Virocop to compare it to. It's a cross between a shoot-'em-up and a platformer, and the nearest I can think of to describe Virocop is a cutesy Alien Breed. According to older colleagues, there was a similar game on the C64 some years ago - although non-one can remember its name! Virocop sets the scenario of a virtual-holiday theme park. You play D.A.V.E. - Digital Armoured Virus Exterminator - who has been given the arduous task of ridding the park of viruses that have taken over and causing havoc on the game Disk. The game zones had been set up on the GameDisk 12 years ago and the public and press were sceptical about the idea of buying virtual time-share experiences in another place without having to go there. The concept eventually caught on though, and soon imitations were springing up everywhere, although none were as big as the GameDisk. But then it all goes horribly wrong when something breaks into the GameDisk. Giant viruses spread across the game zones feeding off the power, and spreading rapidly all the time. D.A.V.E. the Virocop is called for. Graphics are of an extremely high standard and an excellent 3D environment not only looks good but enhances the gameplay. Each level varies form the Sports zone to Military, and all contain enemies appropriate to the theme. Sports, for example, contains deadly snooker balls and animated enemies related to the level. There are also men bouncing around the zone on space hoppers - remember them? Round, plastic bubble creatures filled with air that you could hop around on. All levels look good but the adventure scenario, which is the bonus level for the A1200, is particularly good and has a mixture of wizards and evil robots. Even small details such as flame torches burning on the walls show the attention to detail that has been given. The main sprite is fairly basic and looks rather like a banana-coloured R2D2! Still, he has been rather nicely animated despite his small dimensions so that, for example, if you leave him standing, he lets off steam. His moves actually look robotic too and as his head moveds independently to his body, which is the firing part, it adds to the gameplay!!. Sound-wise, Virocop is nothing exceptional. You are offered the choice between in-game music or just the sound effects. The music changes to fit in with the levels and varies from the predictable happy-o-lucky bounce-along tunes for the Sports level, to the more dramatic such as on the Adventure level. Stereo sound is available when the music is switched off, so the effects are routed to the left or right channel on the event on screen. Most of the sound effects as you'd expect, are a range of shots, bangs and explosions, but apart from that it is quite limited. Virocop comes across as a very polished game and what it doesn't have in sophistication, it makes up for in gameplay. Two-player mode, though, is by far the best option. As well as the usual turn-based system, you have a team mode where one player takes charge of the head and firing while the other controls the body and movement. At first this takes some getting used to , but as you progress this is definitely one of the most fun multi-player methods I've played. Virocop is not the sort of game that will grab you immediately as it isn't particularly striking, but play it for a while and try the two-player team mode and you'll find a game that has playability in abundance. It's not the 'thinking man's' title by any stretch of the imagination, but for the trigger happy this is a title of high quality and provides a great long-term challenge. This is called the strap and I can never think of anything to write. Still I have wasted some space so I can get on with the review, writes Steve Bradley. There is one very odd level in this game. Well, there are a few, but one stands out as being a maverick among misfits. You join it at the end of the first phase, the Sports levels section, one of which you may well have played, for it featured prominently on last month's games Coverdisk. Anyway, you find yourself in the middle of an ice rink. At either end are two cheerleaders (four in total) and they are frozen in blocks of ice. Watching from the sidelines is the fox from Fire and Ice and two chaps who look like they may have appeared in The Chaos Engine, one chewing gum menacingly, the other squeezing a cola can. They could be just regular guys, though. So, this whistle blows and a hockey player enters the rink thwacking energy-sapping pucks across the ice. Two teammates follow and you basically scoot around avoiding the pucks. Getting in shots and picking up cash credits when you can. When you have dispatched the players, you come to a standstill. The ice blocks melt and the cheerleaders skate up to the centre of the rink and you follow, though you are not in control. They then do a little dance and you are given a password for access to the next level. It is quite unnerving the first time it happens, honest - I thought I was going to get 'done' by killer cheerleaders. Virocop has a lot of slightly unusual touches, though it does not disguise the fact that it is very much a shoot-em-up in the traditional mould, despite the rarely used almost-but-not-quite-viewed-from-above perspective a-la The Chaos Engine. The plot is of the garbled futuristic school and the manual wibbles contentedly about GamesDisks and virtual holidays and how a virus has spread and only DAVE, which stands for something or other, can repair the damage. And how the GamesDisk controller got a stern telling off from the finely-monickered boss, Shacklehaus. Virocop is very much a shoot-em-up in the traditional mould. Virocop is quite similar in style to la The Chaos Engine, though, unfortunately, it does not offer a two-player mode. Well, it does, but it is a team mode and one person controls the weaponry while the other moves DAVE, which is not as good as having DAVE times-two trundling around the levels. But no matter, there is plenty here worthy of attention. The GamesDisk viruses are spread across disparate game genres and although this sounds like you get to play different styles of action the premise is basically the same - destroy all and upgrade weaponry at the end of the level. The power-ups are produced by enemies as you dispatch them, though they are quick to depart the scene. DAVE is fluid of movement and those with joypads can change their weapons at the touch of a button. We are Amiga Format, we have joypads. Although the first few levels can be tackled with standard bullets and bombs, once you head into the second series of levels entitled Urban Jungle, extras such as protective plasma, twin missiles and mini flame-throwers come in handy. Graphically, Graftgold have called upon, in particular, Cannon Fodder and The Chaos Engine though rather than copying them, they are more affectionate takes of Michael. In the He Who Dares Wins levels, tiny men with machine gun choppers and tanks surround and blast you without mercy, and if yo did not upgrade your arsenal, the end is nigh on nigh for all but the most gifted blasters. Admittedly, your correspondent is not one such fellow. Virocop offers nothing new to eager bullet heads. It looks great, the visual level (such as the ice rink affair) breaks up the action nicely. You could say very much the same thing about Core Design's wonderful Banshee. it is a shoot-em-up that makes your armpits perspire, that ensures you shout "flip" as you take a wrong turn, or fail to land on the right part of a ramp for the umpteenth time. But importantly, Virocop is fun, not least because it is incredibly slick and it allows you to clunk around the levels at your own pace, working out ways to tackle the next problem. Rather tasty and with many a neat touch. Success. By jove, the music is actually good. I am going for a lie down. Certainly a game which will occupy the battler for the odd hour. A new spin on the genre, Virocop plays with ease. A playable, interesting and visually stimulating shoot-em-up which calmly takes its place along side the Amiga's better examples of the genre. Neue Draufsicht-Action von Graftgold, noch dazu mit einem Roboter? Da erinnert s sich der Redakteur gleich mit Wonne an das legendäre "Paradroid 90" aus demselben Hause! Zu hoch sollte man seine Erwartung deshalb aber trotzdem nicht stecken, denn diesmal hat Andrew Braybrook nur programmiert, das Konzept stammt vom Newcomer Iain Wallington; Der "Digital Armoured Virus Exterminator", kurz D.A.V.E. genannt, muß die "Spieldisk" (eine Art visueller Rummelplatz) von 60 Virenarten befreien, die sich in den 19 auf vier Zonen verteilten Levels tummeln. Dazu benötigt unser Robbi natürlich Waffen, von denen es insgesamt 20 gibt, die entweder gefunden oder zwischen den Stages gegen Energie eingetauscht werden müssen. Allerdings kann D.A.V.E. nur drei Wummen bei sich tragen, und nicht alle bieten Komfort wie unendlich viel Munition. Da der Energiehaushalt zudem knapp bemessen ist und Extras wie frischer Suft oder Unverwundbarkeit rar sind, muß der Virenkiller seine drei Leben also schon beisammenhalten. Aber immerhin gibt es Neustartpunkte (diem man zuvor berührt haben muß) sowie für jeden gelösten Abschnitt ein Paßwort. Auch können zwei Exterminatoren gemeinsam oder nacheinander gegen die Plagegeister vorgehen; bei Teamwork übernimmt ein Spieler das Steuern und der andere die Bordkanone. Apropos, die Steuerung klappt über Zwei-Button-Sticks bestens, mit einem Pad jedoch nicht ganz so exakt. Zum Unterschied zwischen ECS- und AGA-Version ist zu sagen, daß man mit einem A1200/A4000 deutlich im Vorteil ist: Man erhält eine ganze Welt mit vier Levels mehr, bekommt 64 statt 32 Farben sowie schönere Animationen und ein größeren Bildschirmausschnitt geboten, die Ladezeiten sind erheblich kürzer, und man darf das Game auf die Festplatte nageln - die ebenfalls der AGA-Version vorbehaltene Maussteuerung ist dagegen nicht zu empfehlen. Aber auch die ECS-Version sieht gut aus, ist witzig und detailverliebt animiert. Und Gags sind hier wie dort das Salz in der Suppe, denn wo sonst trifft man auf mit MGs bewaffnete Killerbienen oder muß Cheerleader in einer Art Killer-Eishockey befreien? Seine Note hat sich der Virenpolizist also redlich verdient, sie hätte sogar noch etwas höher ausfallen können, würde es sich hier letztlich nicht um ein wenig originellen "Gauntlet"-Klon handeln. Außerdem sind die zusätzlich eingebauten Plattformen eher nervtötend, zumal man dafür auf Hilfsmittel wie Rampen und Transporter angewiesen ist. It could have been called Infectobuzz. Graftgold would happily stick with the Amiga if it were up to them, you know. They've spent around a decade getting to know the ins and outs of the system, and the tragedy of their possible departure from the Amiga is that although they can weave their own magic and creativity on other systems, all the tricks, short cuts and 'special' routines they've mastered on the Amiga will be lost for ever. Like the indigenous Amazon tribes losing their oral tradition due to the encroachment of so-called civilisation and television it's inevitable, and, like images of once independent hunter-gatherers sitting in concrete huts wearing ragged T-shirts, it's immensely sad. crimes laid before AP's very own Kangaroo Court, then this is it. Apart from one biggie of course. Did not the Court in session during AP46 note that littering games with microchips, disk icons and little joysticks constitutes a crime against the gaming public as a whole? And yet Virocop's not only littered with this sort of thing, it also takes place WITHIN THE WORLD OF VIDEO GAMES. It is for this reason that we'll gloss over the plot, and should you buy it, we'd encourage you to do the sam. Being actually set inside other video games, Virocop's just about as hugely self-referential as a game can get. If something's in a computer game, the chances are it's in Virocop, so scan your eyes over the dinky little boxes that cover the four different worlds, and gorge on the feast of game cliches. Among the glut of Nice Touches, one really clever idea has Virocop messing with your idea of scale. The sports zone start off with the D.A.V.E. (a monstrously contrived acronym standing for *hnng) Digital Armoured Virus Exterminator, and in capitals that I refuse to use again) on a pool table, apparently a third as big as the cue ball. Yet moments later, he's on an American football pitch and is as large as the players, and by the time you get to the combat levels, he's a hulking tonnage of metal squashing insect-like squaddies beneath him. THIS IS GOOD, and goes a long way to proving that Graftgold are actually very clever people. Apparently, Virocop started out as a tank game, with you controlling an increasingly powered-up vehicle over various ramp-infested, Marble Madness type levels blowing everything away, but then the Bitmap Brothers revealed Z (a tank-based game o the (hnng) PC) and Renegade had a serious rethink. Although the overall idea's to destroy the nasty 'viruses' that have 'infected' your 'system' (sigh), there's a good reason to kill everything in your path as their misfortune is your credit. Quite literally. Each meany drops a power cell in its death-throes, and when collected, these go towards powering up new and meaner weapons in the in-betweeny microchip sections. The well thought out-ness of the game continues to the weapons. As you progress, you pay for more and better weapons, but can only take three into each zone. You can fire on the move, but if you press fire and keep it pressed while moving the joystick, Dave swivels on the spot and fires in different directions, which is most handy when you're in a tight spot. Also, if you plug in a CD32 pad or a two button joystick, iT KNOWS, and not only lets you use the second button to change weapons (instead of the space bar) but also displays a corresponding icon on the menu screen. Clever, clever. The two player cooperative mode makes things a little too easy by letting one player control Dave and the other control the direction and type of weapon. Obviously, to do this properly takes quite a bit of "Shoot him on the left. No! The left" type conversations, but once you're working together, it's simple to blast through the first eight levels (about half the game) without too many problems. I think the problem is that each level's been so well tuned to be a single player game, with battery recharges placed uncannily just at the point that you think you're going to die, that any extra advantage you may gain, such as firing one way while moving in another, throws the balance off a bit. So many good ideas, so well presented, and yet... I'm not hooked. Despite playing through half of it properly and all of it using level codes (which, incidentally, are unique to each version, so don't bother to send any in), I never really got excited playing it. Entertained, yes, frequently amused, yes, but never excited. I thin that maybe the levels are a bit too big, but that the main problem is that by being clever with the setting, it all becomes too abstract to becoming engaging. The Chaos Engine had all the exciting music, voices shouting out things and of course people at the centre of the action, and it's hard to get too bothered about a robot being attacked by rubbish bins. It's great, it's zappy and well presented, but beneath all the gloss is a fairly standard and unremarkable shooty game, and I can't help thinking that I'd have enjoyed it a lot more if it had been tanks. But then again, maybe that's just me. True to the theming of each of the four sections, the platform worlds have loads of moving and revolving platforms. Obviously. Now, although everything's been done to minimise the annoyance of dropping off a platform, I just couldn't get the hang of them and tended to fall off them all the time. Still, little arrows show you where to stand to get on and off, and even if you do fall, each level's designed so that you're only sent back a short distance, so I guess that's alright then. As well as Pacman, bugs and wormy things, there's also a nice line in Hansel and Gretel houses, and bomb-dropping babies suspended from balloons are a powerful remember to everyone to NEVER HAVE CHILDREN. You have been warmed. The first, not terribly hard, levels are the sports world ones, where huge pool tables merge with small track and field arenas. Apart from the yucky viruses (which blend well into the turf and beize floors), most of the baddies are objects rather than creatures. Nice touches include the way you have to shoot the pool balls to a stand still before they explode, and the kids with remote-controlled planes. Since when you shoot the kids (normally in the back), the plane crashes and explodes, scattering goodies around, the trick is to wait until the plane's close before offing the child. Like all the levels, falling off edges is a constant problem, but if you drop onto the cushion on the pool tables rather than ending up on the playing area, you can usually take a shorter route back up to your start point. A small point maybe, but yet another mark of Graftgold's attention to detail. The fantasy worlds are the hardest and also the least enjoyable ones, although I reckon these two facts are independent of each other. By the time you get to this bit, you'll have plenty of big and powerful weapons to blast everything, but that's not the problem. We're back to instant deaths caused by water again, which is a big problem due to the large number of jetty sections in these levels. Where's the justice in being killed by gettting a pixel too close to the edge, huh? Anyway, kudos to the graphics designer and his obvious nod of recognition to the style and look of the Chaos Engine which, despite being a few years old, I still prefer to this. Sorry Virocop. Sorry Graftgold. Sorry Dave. The combat zones make Dave look huge, and give him the chance of running over little soldiers, who all go 'Eek'. In a game drenched with great little bits, these levels have by far the best, with miniature soldiers straining upwards to load huge mortars and tiny parachutists creeping out from under their grounded canopies. Guns and missiles whistle over the heads of your diminutive foes, forcing you to use the nifty green zappy weapons that work at ground level. Access to different bits of each level is usually along precipitous railway tracks, which usually means getting half way there and then beating a hasty retreat as a train bears down on you. Annoyingly, due to my inept control, I frequently plunged over cliffs and into water, resulting in a harshly punitive instant death. I didn't like it at all. The boss-tank in the final level is truly a thing of beauty, spouting missiles and disgorging bombs and troops like some Chobam-clad, diesel-powered warrior mother. Your basic shooter. With ejecting cases. And an ever-so-handy three-way one. Neato. Bombs are only good at long range. Rockets look great. Need another reason? Low-lying rays take out the little soldiers. Landmines. Useless. Avoid and discard. The flamethrower's fearsome up close. While the laser's mean at any range. UPPERS A fun two-player option, flawless graphics and presentation. The levels are perfectly designed, with recharge points just where you need them. It supports all Amiga configurations AND it's hard disk installable. A textbook example of how to produce a professional Amiga game. DOWNERS And yet, it's not massively absorbing. Entertaining certainly, and challenging too, but not terribly exciting. Odd that. And I hate falling off ledges to my death. It's great, but no classic. The perfection of the design and loving care lavished on it don't make up for the repetition or lack of anything monumentally exciting in the game. It's fun and it's a fair price for all the hard work that's been put into it, but you could still live without it. Such is the might of Graftgold that in this non-AGA version, the only noticeable thing is the lack of ejecting shell cases. They claim a reduced colour palette, but I couldn't really tell. Graftgold have a long-standing reputation to keep up on the Amiga and what is sadly their last game does nothing to diminish this. ViroCop, a madcap shoot 'em up with platform elements, is about as smooth as you can get without Johnston's Bay Oil and the graphics on the AGA version, reviewed two months ago, were pixel perfect. But how does the ECS version fare? Well, gameplay wise it's almost exactly the same, with no discernible difference in speed unless you've played it on an A1200 with a fast accelerator inside. And graphically the reduction in colours has made little difference to the quality of the game. 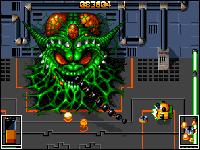 ViroCop involves controlling a little robot known as DAVE, or the Digital Armed Virus Exterminator in a quest to get rid a place called GameDisk of evil, draining viruses. GameDisk is a virtual playground where humans go to enjoy themselves. But an octopus-like strain of viruses have recently invaded it and made its inhabitants unpredictable and dangerous. GameDisk consists of four lands: Sports, Urban Jungle, Gods and Crusader levels. The last land on the AGA version, Silicon Valley has not been included here, which cuts down longevity, but although the most difficult, I found it to be the least interesting so you aren't missing that much. Your enemies are the viruses but because they've driven all the other inhabitants of GameDisk insane you also have to deal with enemies as diverse as fast bowling snooker balls, invisible baseball batsmen, kids on spacehoppers, tennis ball practice machine, knights and Cannon Fodder style mini soldiers. At the end of each land a points increasing bonus game is provided. DAVE has access to 16 weapons during the course of the game, but apart from the initial three (gun, mines and bombs) you have to earn them. This is done by collecting power pickups from dead enemies. 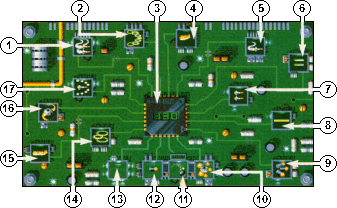 When you have completed a level you will enter an upgrade screen which takes the form of a printed circuit board. Here you select the weapon you want to get hold of and then use the power you've collected to reach it through its circuit. More powerful weapons have longer circuits so it could take several levels to reach the juiciest weapons. Despite fewer levels and less fancy graphics, I recommend ViroCop. A bit repetitive at times but the design and gameplay shine through making this one of the best shoot 'em ups currently available for the Amiga. An antibody. What a terrible name for something which is actually rather useful. I used to read horror novels and I definitely saw horror movies long before biology arrived on my school curriculum and thus spent a sizable part of my youth thinking that an antibody was like an Antichrist, only worse. It stands to reason: If it's an anti-your-body, it's gonna kill you, right? Horribly. A quick cuff on the back of the head by my Biology master (a priest, would you believe) soon cured me of this delusion in no uncertain terms. The hero of this game is a sort of antibody. A mechanised armed, robot antibody, called DAVE or the Digital Armed Virus Exterminator. And the storyline is short but sweet. Viruses (who look like green Jabba The Hutts) have inhabited a virtual games theme park called GameDisk and DAVE is sent in to sort them out. The gameworld is split into several zones some of which pay homage to an awful lot of popular games of the past. You start off in the sports world which is filled with American football gridirons, pool tables, baseball parks and bouncing footballs. You then move into a platform world called the urban jungle, where you have to climb terraces, speed around the roofs of houses and cross platforms. The next level is the gods level, where everything is in miniature, except the viruses and DAVE. Here tiny troops attempt to stop you, but inevitably end up dying horribly in Cannon Fodder style. The Adventure world, known as Crusader is filled with swamps, castles, ghouls and knights while the final world, Silicon Valley is right in the depths of the computer that controls GameDisk and the surroundings are circuit board, chip and transistor orientated. The type of enemy varies widely throughout these levels, from pool balls, American footballers, Scalextric F1 cars and kids on space hoppers in the sports world to microchips and guided missile turrets in Silicon Valley. As mentioned earlier some of the levels and creatures pay homage to the past: there are whirlwinds which turn into demons (like Ghouls 'N' Ghosts) and the adventure level has swamps filled with frogs reminiscent of Chaos Engine. Virocop has been produced by Graftfold, with the magic hands of Andy Braybrook, Iain Wallington and Steve Turner at the keyboard and this pedigree and quality shows. Everything is smooth, from near perfect sprite detection to a fast, economic and intelligent loading routine - which means that it's a pleasant to play from disk. But just in case, it's hard disk installable (Praise be! A platform game that's hard disk installable. There is a god). Also, just in case you've any doubts as to who is responsible for the game there are plenty of hints, logos and famous characters from past ventures on the background scenery. DAVE has three weapons slots which, at the beginning, are filled with a single shot gun, a grenade launcher and a mine layer. These can be added to by picking up icons that provide you with a range of weapons including a multi-irection, multi-shot gun, a smart bomb which causes damage to anything and everything on screen, an invincibility shield and destructor drones. Throughout each level you can pick up and store power icons that allow you to shop in between levels. The 'shop' is like a printed circuit board with connectors to 12 different weapons. To make a weapon available for use you need to power it up. These weapons include mines, lasers, guns and homing missiles. The more useful the weapon, the more power you need to get it. Once you have more weapons available you can insert them into any of DAVE's three slots, picking the best weapon to deal with a particular situation. The password system, which is unique to each copy of the game (you won't be able to use another person's level codes), records the level, the amount of lives and the weapons you have available for use. This means that you can go back and pick a more appropriate weapon to deal with an enemy second time around. 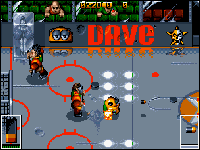 Although it has a two-player mode you still have only one DAVE, with one player controlling his movement and the other controlling his firepower. This sytem tends to lead to heated arguments when the controller doesn't go in the direction the gunner wants them to. The only other problem is that although Graftfold have gone to great pains to make each world unique, the gameplay doesn't differ that much between them. The platform level isn't significantly different from the regular fare, nor is the shoot 'em up one. Never fear though, you're unlikely to get bored. ViroCop is great fun throughout and the difficulty curve is just about right. Original and not-so original enemy sprites are a joy to behold and you can't help laughing at some of them - until they kill you that is. Progressively getting hold of new weapons and selecting the right ones for the mission on hand means that you never get put off and always return to a level to beat all the bad guys and to collect enough power points to get a really big weapon. In summoning up I have to say that ViroCop is a well planned, superbly executed game that gets a bit predictable from time to time, but remains good fun and highly addictive. Yep, there's a non-AGA version on its way, with slightly less colourful graphic treats but probably as much gameplay, if Graftgold are men of their word (and on past record they surely are). The armoury. DAVE has this chip, right, and it's got 15 weapons on it. But he doesn't have enough power to reach them all. The only way to get them is to collect power pick-ups from terminated enemies, try not to get killed and use the points collect to reach the weapon of your choice, either in one go or in several stages. TWIN HOMING MISSILES Expensive but deadly babies. Just the job. PLASMA SURROUND Protects DAVE, but not that well really. CENTRAL BOX This figure represent the amount of power icons you've picked up. SHORT FLAMER Weedy version of the real flamer. OK though. SINGLE HOMER Cheaper than the twin and half as effective. TWIN BOLT LASER Reflects off walls. This is interesting. TWIN MISSILES An early favourite; however, it only fires a few shots. BEAM LASER A bit crap, really. Not very exciting at all. THREE WAY BULLETS An old favourite and why the hell not? CLUSTER MINE One of the default weapons. Limited but OI. MORTAR Useful for targets above eye level and over walls. THE BULLET Standard, inexhaustible but weak weapon. THE EXIT When you're finished click here and the game starts. PLASMA Cheap and inexhaustible; the first weapon upgrade. LONG FLAME THROWER Inexhaustible but very power hungry weapon. STARBURST Useful mine-based weapon. But not that good. MISSILE SPREAD A short range 8-way missile cluster launcher. Fast fun and highly addictive.